I love that embellishment. Easy, you say? How cute! That blouse is adorable! I love the embellishment and the blouse is stylish and cute. How is the embellishment done? Another cute one. Yeah, my 10 year old would be wearing this over a turtleneck. Maybe it will get over 60 today! That is so super cute - I love the embellishment! 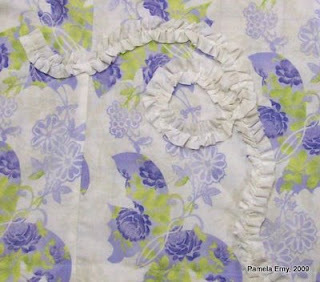 What kind of fabric is the ruffled embellishment? Did you just leave a raw edge? 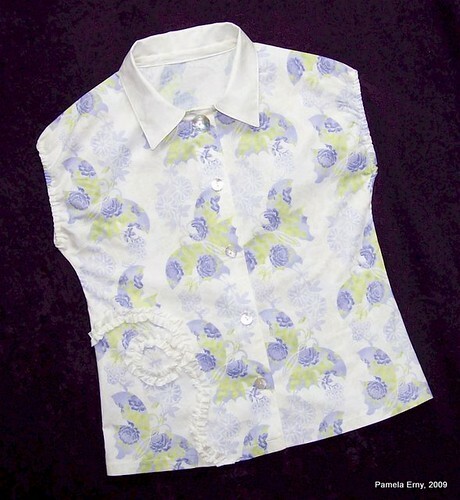 So glad you like this little blouse..it was a delight to sew! The bias strip of fabric is just a lightweight woven cotton, and yes, I did just leave the edges raw. More information about how I did the embellishment is now on the blog post. Ah this blouse is sweet! I too love the embellishment. It's a nice touch! Love that! Totally awesome embellishment! So cute! Feminine but not gooey. So cute, and of course, the perfect embellishment. Love that fabric. Very pretty blouse --- I love the fabric choice but especially the ruffle embellishment!